1 English side dominates against international opposition before losing on penalties. In the words of Morrissey: “Stop me if you think that you’ve. Heard this one before.” I have been talking Phil Jagielka up for an England call-up and it looks like his penalty-taking is already at the required level. 2 What a beauty from Mikael Arteta. Goodison Park was rocking after his long distance strike and it looked certain that Everton would progress. 3 Everton may have dominated on the pitch, but on the touchline Fiorentina were in charge. 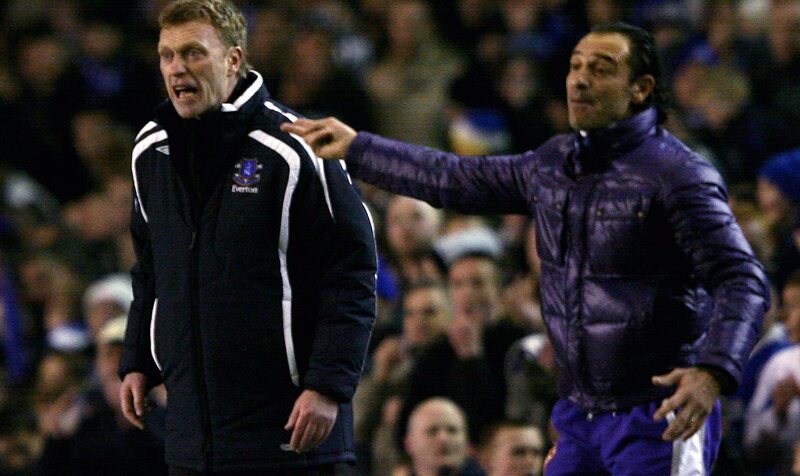 You can see coach Cesare Prandelli pimping out David Moyes above. 4 The PA system at Goodison Parks needs to be turned down a bit. 5 Andy Johnson scored with his chest last night, his elbow at the weekend… is using your feet going out of fashion in football? We will have to wait to see what he decides to score his next goal with!